Uncomfortable; Humiliating; Traumatic–words patients too often use to describe pelvic exams. At Your Cervix is a documentary film that begs the question: Why do so many people have horrible experiences with pelvic exams? Filmmakers Amy Jo Goddard and Julie Carlson are women’s health activists who met in 2001 while training to teach medical students how to perform comfortable and empowering breast and pelvic exams as Gynecological Teaching Associates (GTAs). 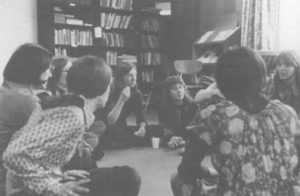 What makes this labor unusual, and incredibly radical, is that the Gynecological Teaching Associates use their own bodies to teach. As simultaneous “patient” and instructor, GTAs are able to guide students through the exam and give immediate feedback about their technique, a vantage point no mechanical model, anesthetized patient or fellow student can give, and that a professor who is simply “teaching” alongside the exam table cannot provide either. After becoming GTAs, and teaching in every major medical institution in New York City, Amy Jo and Julie realized that almost no one knows about this work. They knew first hand how important GTA work is and the impact it has on students of medicine and nursing–and they thought more people should know about it. They also began to question why pelvic exams are still so dreaded even though GTA work has been around since the 1980s. In their journey to document this work, they discover that many future doctors and nurses are learning pelvic exams in the most egregious ways; such as medical students “practicing” on unconscious women without consent and nursing students being required to practice on each other. 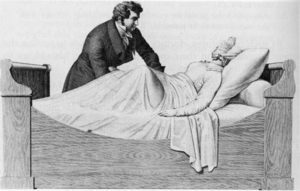 Is it possible that these teaching practices lead to the humiliating and traumatic pelvic exams that so many patients experience? Amy Jo and Julie are on a mission to improve pelvic exams, and they go on a quest to find out why patients have horror stories about gyn exams, what students are learning, and how to change our approach to gynecology to one of empowerment rather than dread. Please help us spread the word, end the horror stories and create empowering gynecological experiences for all patients.